After delaying the release of the Gear S3 frontier until the end of June and launching its own Wear24 smartwatch last month, Verizon made a surprising move and introduced the LTE-enabled Samsung Gear S3 classic. If this is the wearable that you've been waiting for all this time, then you can now purchase it for $349 on a two-year contract. 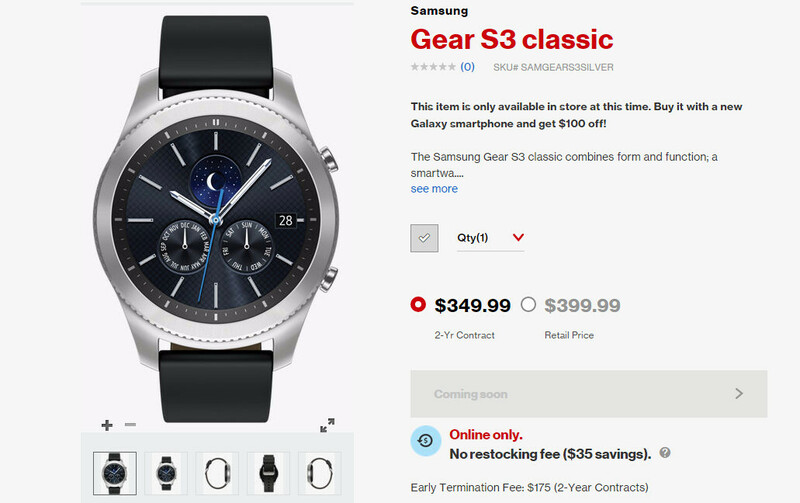 Also, Verizon offers the Samsung Gear S3 classic LTE for $399.99 outright, if you don't want to be tied to a long-term contract. The LTE version of Samsung Gear S3 fully supports Verizon's sync feature, which means you will be able to send or receive calls and texts using your phone's number, while you have LTE connection. On a side note, AT&T and T-Mobile offer the Samsung Gear S3 LTE as well. The former is selling the smartwatch for as low as $249.99 with a two-year contract, whereas the latter has it available for $384 on a 24-month payment plan, or $399.99 outright. Samsung Gear S3 classic LTE runs the latest version of Tizen OS and sports a 1.3-inch display with 360 x 360 pixels resolution. The smartwatch is equipped with a 1GHz dual-core Exynos 7270 processor, 768MB RAM, and 4GB internal memory. It's powered by a 380mAh battery that's rated for up to 2.5 days standby time or up to 26 hours of usage. Jeez, only six months after release on AT&T and T-Mobile. Way to go, Verizon!